The Grand Sturdy 45.0 Sedan, introduced in May of this year, is, together with the AC version, in a class of its own. The saloon and large open cockpit with characteristic Linssen Longtop® provide a lot of comfort and living space on board. It makes the 45.0 Sedan the ideal travel boat for short or longer trips on Europe's inland waterways. The Grand Sturdy 45.0 is now also available in a special edition similar to the "white interior style" of our flagship, the Grand Sturdy 500 AC Variotop®. With similar style and colour elements such as white leather, white corian worktops, white wall coverings and plissés in the saloon and white floor covering next to bed in front and aft cabin. This unique package is available for the special offer price of € 4.500,- (excl. VAT). The Grand Sturdy 45.0 Sedan "White Edition" is currently in production and can be seen there. Make an appointment with one of our employees or your local partner. During the Linssen Yachts Boat Show in November 2018 (17-19/11) this model can be admired in our showroom. Also our Grand Sturdy 45.0 AC and Sedan are now also available in single-engine version. This ultimate travel boat is suitable for all waters and you can choose which motorization best suits your cruising area. We can certainly advise you on this. I am interested in the Grand Sturdy 45.0 'White Edition'. The interior is packed with unique features and USPs. A forward compartment with a spacious front cabin with separate toilet and shower, a guest cabin with two single beds with toilet and shower combination in the hallway. A spacious living room with richly equipped pantry and enough living space to enjoy breakfast, delicious cooking or enjoy life with family and friends on board. There are also many storage spaces in cupboards, shutters and in the multifunctional basement storage room under the salon floor. The AC also has the luxury aft cabin as owner's cabin with toilet, shower and plenty of closet space. Below (only a few) of the highlights (standard or optional) of the AC and Sedan versions. 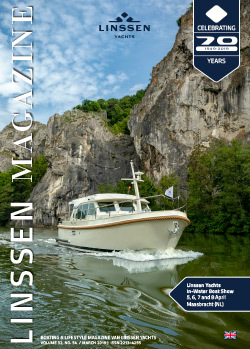 The combination of HPH hull shape, keel shape, free-hanging rudder blades and other Linssen details in the drive configuration makes the cruising characteristics absolutely sublime. Something you really need to experience for yourself. Contact the shipyard or your local Linssen representative directly to find out more about the possibilities.